Does Rachio plan on having integration with Google Home like it does with Amazon Echo? And…? Let’s go boys and girls, get on it! rachio is the only thing I don’t have connected to my Google home! Ecobee, ring doorbell via smartthings, along with my entire house! You probably should make this the highest priority. While it’s certainly not a necessity, it would be cool to get similar functionality with Google Home (via Actions). As mentioned above, lots of good info there and HERE. Thank you for posting that link, very useful information there! Google Home is definitely something we have discussed and is on our radar. Do you currently own a Google Home? I am curious how it compares to Amazon’s Alexa! Our Google Home arrived under the Christmas tree, so It’ll likely get set up this weekend. Android Central did a quick comparison HERE (with a video going back and forth with commands). It sounds like each person considering either of these needs to make a list of pros and cons, and come to their own conclusion. Im also waiting for this integration. Google home works better outside the US as Echo doesnt seem to navigate directions and traffic in coordination with Google maps. However Echo has better integrations across various apps and gadgets, waiting for google home to catch up. 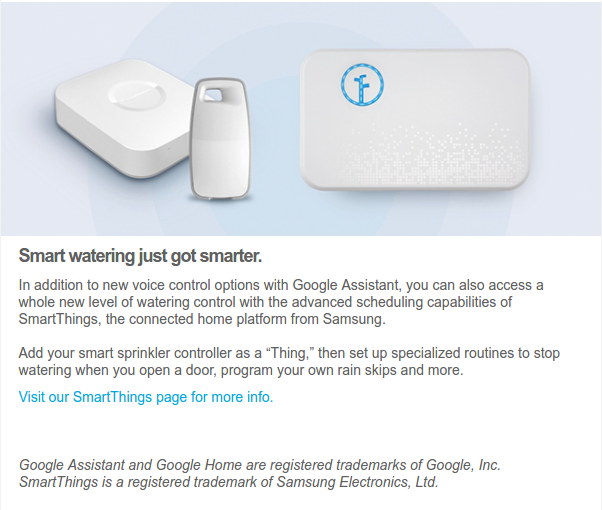 Also, is there a plan to integrate with SmartThings hub? We’ve been working on a ST integration for quite some time. We are in the validation phase and after testing is finished will release the integration. +1 on the Google Home integration! Santa also brought a Home home (pun intended) for me this year. I would love to integrate my Rachio with it. I have both Alexa and Google Home and Google Home is by far the better of the two. I have everything except my Rachio hooked up to it. I was excited to see you added integration this week, however I can seem to figure it how to link my Rachio account. It very simple to link my Harmony account today. @PhxPhlyer I’m sorry to hear you are running into issues- have you checked out this support article? It has some helpful tips… Let me know if I can answer any other questions. Yes, after posting my comment I found the instructions on your website. However, I tested voice control of my 6 zones and your Home integration app does not recognize two of my zones by name. It does recognize those zones by number. I speak good English so that’s not it. I think if the smartthings integration allowed treating the zones as switches, which could then be imported via smartthings like any other switch into Google home, that would be a superior mechanism for integration. Then all you’d have to say is “hey Google, turn on zone one” and not have to worry about the “ask rachio to…” bit. “hey Google, turn on zone one” and not have to worry about the “ask rachio to…” bit. @njhaley, I believe you can do this via IFTTT with GH per this thread reply. I haven’t tested it yet, but might be worth checking it out. Nifty - yep, that’d be an effective route I hadn’t considered. I use ifttt so infrequently with home since the smartthings connection is pretty solid. But it would be easy enough to set up a “zone one/two” command.